This is the second in an occasional series in which High Country News interviews scientists and researchers whose work is important to the American West. The consensus is clear: Human-caused climate change is real, and it’s already altering ecosystems — and the human communities they support — across the West. Yet the Trump administration has marginalized the science of climate change, including by scrubbing references to human-caused climate change from reports and websites, appointing administration officials who deny its existence, and prohibiting some federal scientists from presenting on climate change. In response, Westerners are demanding that climate change be taken seriously. Scientists have joined in, by marching, podcasting, writing and more. High Country News spoke with climate scientist Jonathan “Peck” Overpeck, a renowned researcher who is also passionate about public engagement. 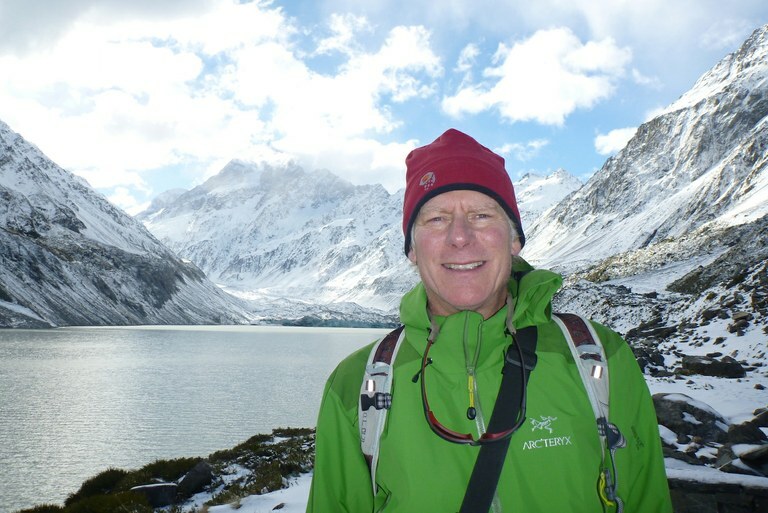 Overpeck stopped by New Zealand’s Aoraki/Mount Cook National Park on his way home from a 2012 fellowship at the University of Melbourne, where he learned about Australian approaches to climate change. Overpeck spent 17 years at the University of Arizona researching the climate. He studied topics as varied as the Southwest’s changing water availability, sea-level changes over millennia, and the possible legal implications of climate change. He served as a lead author on two Intergovernmental Panel on Climate Change assessments, including the Nobel-Prize-winning 4th assessment. In 2017, he co-authored a study with climate scientist Brad Udall that linked hot temperatures to decreasing flows in the Colorado River. Overpeck recently became dean of the University of Michigan’s new School of Environment and Sustainability. HCN: For a lot of people, climate change still feels really abstract. People are still going to drive to work, buy groceries that have been shipped long distances, run the air conditioning, shop online. How do science communicators connect daily life to climate change? By making it personal? JO: Another thing that goes with that is to respect worldviews. For example, a lot of people are willing to make sacrifices to protect our climate or ensure that endangered species don’t get snuffed out. Other citizens don’t feel that it’s their obligation to change their lifestyle. I think it’s important to respect that. At the same time, there are things we can all do to fight climate change that really won’t affect our day-to-day. I think it’s important to respect the fact that some people don’t want to have a more “green” life per se, but they might be willing to chip in on finding solutions to some of these huge problems. If we all vote today, everyone in the United States, to prohibit the use of fossil fuel and to allow only renewable energy to be used, probably five years from now, we would all pat ourselves on the back because we would have a stronger economy, cleaner air, less illness and fatalities from pollution, and so many of the climate change impacts would be avoided. But you could still, say, drive a car that can go zero to 60 in four seconds, because it would be powered by electricity instead of gasoline. HCN: What is your perspective on being both a scientist and a science communicator? JO: Scholars can no longer stay at their desks and hope that what they learn, the knowledge they create, is somehow going to find its way to being used and useful for society. I think we have more of a moral compact, now, to engage with potential users of knowledge, to ensure that they have access, so that we become a resource for everybody in society. HCN: How did you get interested in climate science? JO: My dad was a geologist and my mom ran a nature museum store, so at an early age I was helping her buy minerals and hunting for fossils with my dad. I was just really into rocks, and fossils, and minerals, and then I was also really into the outdoors. I spent a lot of my youth camping, and hiking, and canoeing — you name it. I saw being a geologist as a way to spend my entire life outdoors. At some point, though, I found myself being attracted to a graduate school that had a really strong climate program, and I got sucked in. It was at the beginning, really, of paleoclimate science (the study of past climates), and I was in at the ground level. It was just an incredibly exciting time to be doing scholarship in that area. Before I knew it I was really just hooked. My other love has always been history, and (paleoclimatology) was a way to combine understanding our environment with a historical perspective. The only difference is instead of reading books, I was reading rocks, sediments, geochemistry, fossils. HCN: Was there a turning point where you decided to start engaging with the public more? JO: There was definitely a turning point around 20 years ago. I was building a program within (the National Oceanic and Atmospheric Administration) from scratch, focused on paleoclimatology. We were always questioning where the next increase in funding was going to come from, and why Congress couldn’t generate the money we needed, because they knew it was important. A little light bulb went off — it sounds kind of simple in hindsight — “Oh, you know, I think it’s really the constituents of the congressmen who have to see the benefit of the science in order to want to fund more of that science.” I realized that if there’s going to be more resources for science, we have to prove that we are giving society what they want. This was when the climate denial movement started to pick up, and special interests were really trying to downplay the reality and importance of climate change. I realized we need to get out in society and we need to provide citizens and leaders in society with a more clear understanding of what’s at stake here. HCN: What risks is climate change posing to the Southwest’s water? JO: There’s little doubt that the Southwest is essentially going to be the sharp edge of Americans’ climate change crisis, just as the low-lying coasts of the Gulf and East Coast will be. I’m not someone who says climate change is going to be a complete disaster for the Southwest, but I think the Southwest has to really think differently if they’re going to let climate change continue. The Colorado and Rio Grande rivers already are losing a lot of their flows because of the warming. The places where (there is) a connection to the Colorado have to learn to get by with half the water that they have now, or less. And lots of communities in the Southwest don’t have access to large, sustainable river systems like the Colorado. Those other places that aren’t connected to a river — that are just living on groundwater — they could be toast. Even if they have some rain now, they’re not going to have as much rain in the future, and they’re mining their fossil groundwater. Plus, politicians are just seemingly ignoring the problem, and that means they’re basically selling out future generations of Southwesterners for a short-term good. Maybe they’re getting campaign support from big oil and big oil friends, but basically they’re selling out the Southwest. I love the Southwest. I lived there for 17 years. I have a lot of friends there. I love the landscapes, the vegetation, the animals. But I’m really worried about the Southwest as a place that’s going to thrive. HCN: Is our expectation of being able to curb greenhouse gas emissions overly optimistic? JO: I think we’re being overly optimistic about what we can achieve. The most devastating greenhouse gas is carbon dioxide. That comes mainly from the burning of fossil fuels, and unfortunately, carbon dioxide stays in the atmosphere a long time. Some of the molecules that are up there now will be in the atmosphere one thousand years from now. If we could just magically stop all greenhouse gas emissions right now, double (the warming) we’ve had so far— double almost one degree Celsius — is pretty much a given, and that’s the best we can do. HCN: What is the climate overshoot? JO: The whole concept of the overshoot is relatively new. Our biggest concern with respect to climate change is that the climate could just get too warm, and all the other associated changes that come with the warmth — the huge storms, the hot drought, the extreme precipitation, the massive movement of biota across the landscape, and potentially mass extinction — all of these things occur as we get to some threshold in a future where the planet is just too hot, and the change is just too big. So what we’re trying to do as humankind is to slow the change down and not push the planetary climate system too far. The idea is that if we can keep the warming down to one and a half to two degrees Celsius, the damages won’t be catastrophic. But what we’re discovering is that trying to achieve that goal could be really tough, so people start talking about overshoot — maybe we can’t actually stop the planet from going over that dangerous threshold. Then our goal has to be to come back down as quickly as we can. That’s the overshoot: we’re shooting over the dangerous level of climate change by a small amount, and then coming back into the safe zone. HCN: Some friends and I went backpacking along the Blue River in eastern Arizona this weekend. It was incredible to get away from town and to see so much — the water, fish, javelina, deer — but should I feel guilty about driving 340 miles round trip for recreation, given the carbon footprint? Does being a climate change researcher influence the way you live your life? JO: That’s a hard thing you have to live with. I’m married to another climate scientist, and so we make choices wherever we can to reduce our carbon footprint. All the electricity at our house is renewable clean energy — solar and wind. Our car is an electric hybrid, so I rarely buy gasoline for our car, except when I go on long trips. I still go on long trips. I still think it’s important to take the family to go pretty places and hang out in nature. The costs are there to the climate system, but the benefits are also great.